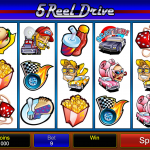 5 Reel Drive is a video slot game from Microgaming that gives you the ultimate American highway experience. If you are a fan of simple retro games then this is the right one for you. The graphics are as simple as they can be with 2D symbols and sound effects that remind us of old slot machines. All the symbols have something to do with the theme, things that you will find or see while you are on the road. As we mentioned before 5 Reel Drive is a very simple slot. So this means that there is nothing much we can expect in the special feature department. We have a wild symbol which is a yellow road sign. The wild will substitute for every other symbol except for the scatter in order to complete a winning line. The scatter is a police car and unfortunately it does not trigger any feature it only offers scatter payout. The good thing here is that the scatter symbol can appear anywhere on the reels, meaning it does not have to be on an active pay line. 5 Reel Drive is one of those Microgaming games that are as simple as they can get. The truth is we really need this kind of games. Sometimes we want to avoid all those complex features that are at times impossible to trigger. The reason this game is still on the market and appealing is proof enough that it is worth the try. If you are into simple slots that offer some good wins then this is the right slot for you. If you have not played it yet, we think it is about time you do. 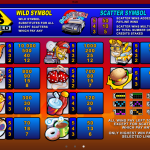 If you like massive jackpots you should consider playing WowPot a 3 reel slot by MicroGaming.